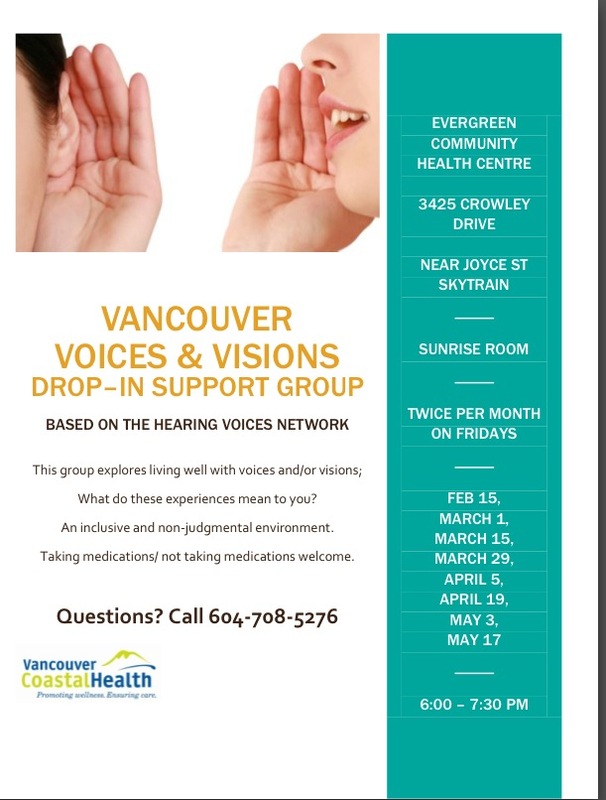 The Vancouver Voices and Visions Support group is based on the International Hearing Voices Network and explores the theme of living well with voices and visions. It is a peer lead pilot program of Consumer Involvement & Initiatives, Vancouver Coastal Health. Questions? Call 604-708-5276. Below the Group Flyer, you’ll now see a flyer for some events related to hearing voices taking place on April 10 & 11. 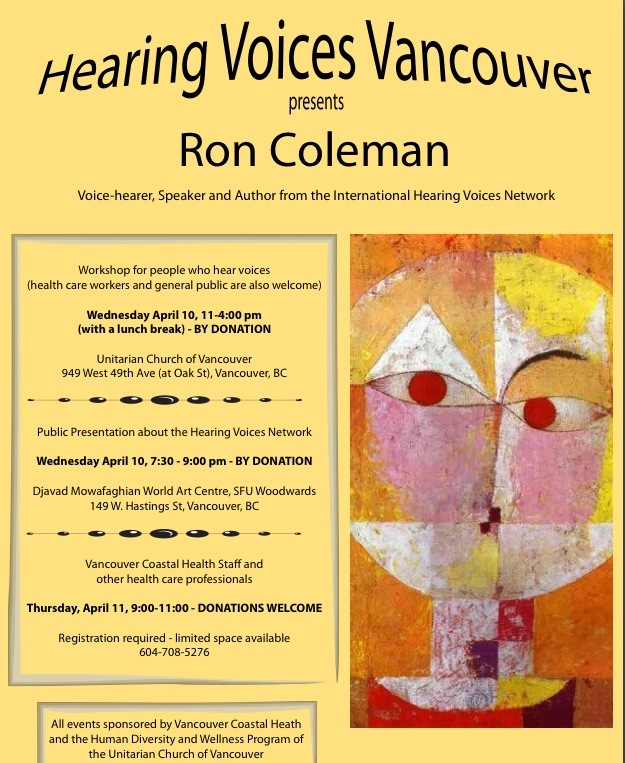 These events are sponsored by Vancouver Voices and Visions in partnership with the Human Diversity and Wellness Program of the Unitarian Church of Vancouver. Today’s article is by Winter Hammell, who writes about childhood memories, his struggles and his experience of recovery. Recovery means re-connecting with my life. Acknowledging, even accepting, the good and the bad of it. The word invokes visions of endless, cheerful sunshine; of family picnics and ice-cream and corn-on-the-cob; of camping trips at Long Beach and bonfires, and of playing at Spanish Banks in the long afternoons which turned to sultry dusks. It conjures up memories of sunburns, skinned knees, and of us kids running and racing and bike-riding like maniacs through the school-less days; of play-fights and real fights, and battles with dragons; memories of endless days of fun and adventure punctuated with intervals of sleep; of songs and jokes, pranks and laughter and the piping of high voices; memories of being a Cub Scout; of salmon-fishing with my Dad at the summer cabin up the coast past Gibsons; of the smells of cotton-candy, fried onions and hotdogs at the PNE – of the noise, of the feel of goat- and sheep-fur in the petting zoo; memories of rides on the Tilt-A-Whirl and the Mad Mouse, and of getting sick from eating too much cotton-candy, hotdogs and candy-apples. Two men were actually walking on the Moon! I smoked my first and last cigarette, drank my first and last beer and discovered the magic of gin, which I seemed to naturally have “a taste for”. Recovery: I haven`t had a “gin-n-seven” in forty years, no longer drink any alcohol, don`t smoke, don`t take street drugs or abuse my prescription drugs. Still, there is chocolate. Winston Churchill’s “Black Dog” – depression – and my unnamed mental illness came bounding out of nowhere, it seemed, and bit me hard. They had strong jaws, sharp teeth. They were vicious and cruel. I started to thread real beads of every shape, colour, size and material: plastic, wood, ceramic, metal, stone, glass, cloth. It was 1969. Too young to be a “hippy”, I was an honest “wannabe”: I had a pair of brightly-multi-coloured “bell-bottom” jeans and long hair. I miss the hair. Over the years, in my mind and in my heart, I threaded beads of hurt and pain, of joy and success, of growth and diminishment, of great beauty and disgusting ugliness. 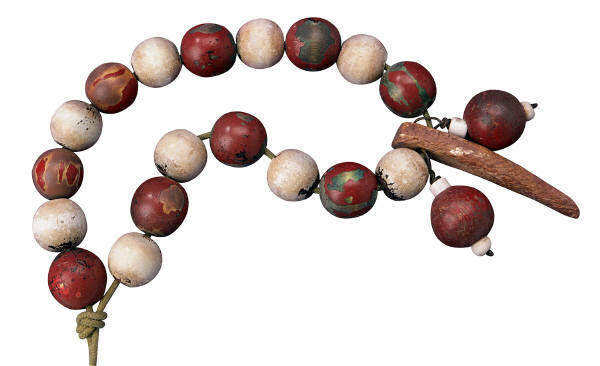 There were beads like lumps of coal and beads like glittering diamonds – the same material! There were a great many lovely, brightly-coloured beads, and some really hideous ones. Depression was a single heavy, black, sticky-gummy, cancerous bead: one was too many, but I had to use it. Mental illness beads were sharp like shards of glass: I had to be careful not to cut myself, which I often did, knowingly and unknowingly, but I had to use them. Wellness beads were shiny and smooth, and came in dozens of shades of blue: there were never too many. I used them all. There were beads I would have begged for, if they had not been so generously given to me, and beads I would have died to get rid of, if they had not been taken away by strong, loving, caring hands. I was only twenty-seven years old when my illness returned, something more horrible, like a black-magic curse, both deep and profound. I spoke little, and stopped writing. A magical moonrise or the petals of a hydrangea or the love of a life-partner or the friendship of a cat held no joy for me. Food tasted literally like dirt and ashes. I`d tried the real thing. My sleep was affected. What I got was not restful. Three months went by, unmarked by me on the calendar of my life, without any change. Our family doctor referred me to a psychiatrist. Despite this, I got well again. Two years later, a few weeks past my twenty-ninth birthday, my illness – now a living, sentient creature, like the dog, a deadly Thing – said my life was not worth living. I believed it, and attempted suicide, and was committed. Hospitalized for nine weeks. Drug therapy. Group therapy. ECT. Time. And nine weeks of really, really lousy food. I didn`t care. After I got out, the West End Mental Health Team took me in. I was severely depressed. My mental illness was named and dragged out of the shadows. It wasn`t so scary out in the light. My sleep was still rest-less. I never felt rested, not on three or four hours a night. I went to the Team every week. I got well, yet again. Over those years there were more trips to the local ERs, and more serious hospitalizations. The food never got any better, but I began to care about it. This was a serious matter! My next day might have been my last for such a long time that when my life started to become healthy I barely recognized the change. Two months without overdosing became two years. One year without a hospitalization became a year and three. Five. Seven. One month without cutting became five. Nine. Eleven. I was getting better…only to slip back again and again. But I was not slipping back as far. There was steady, forward movement. I was already recovering, though I did not really appreciate it, or even let myself believe it. There were new, shinier, brighter beads. Now I am writing regularly, and have had some work published in: “The Networker”, “CMHA”, “QMH”, “In a Nutshell”, and “On Our Way: Recovery News” – and here! An on-line children`s magazine has purchased one of my short stories. Lots and lots of beads of accomplishment. Real beads. To whom, and to what, do I attribute my recovery? Hard work on my part, and the work of others: family who love, and professional psychiatric help who judiciously use their knowledge. Groups of people who share, and accept and do not judge. Dynamic group leaders, insightful therapists and determined case-managers and cats. Pals and medication and, even so, The Time That Heals. More, better, restful sleep – that still comes and goes, is iffy. And better food. I have a large collection of Recovery beads. Contentment. An interest in things. Pride in my talents. Feelings of self-worth and acceptance. Creativity. Feelings of peace. Hope. But sometimes the black dog bites the strings, scattering the wellness beads. My mental illness settles on my shoulders: it`s always heavy, always hungry. Lost, alone and desperate, afraid, unsure and empty, helpless, I stop feeling my feelings – can only name them – and stop “living”. I just start re-stringing the Recovery beads. Today’s blog entry is an interview with a student from Vancouver Mental Health and Addiction Services’ Peer Support Training – Class of 2012-13. We’re accepting application packages for our next training. Deadline is March 8, 2013 for a training that will start in Sept. There’s a link to the application package near the top of the blog site. You can also call 604-708-5276 for more information.